If you’re looking for keyword tools like Wordtracker, WordStream has everything you need. Our suite of FREE keyword tools enable you to perform comprehensive keyword research, identify new opportunities, and refine your keyword targeting strategies to see greater return on investment. WordStream’s free keyword tools were designed by search marketers, for search marketers. All of our free tools are intuitive and easy to use, freeing up more time to focus on what really matters – growing your business and providing greater value for your clients. WordStream’s Free Keyword Tool is the most comprehensive keyword research tool available. This free tool leverages the power of WordStream’s aggregated 1 billion keywords drawn from more than 1 trillion unique searches to provide you with the most highly targeted and relevant keywords for inclusion in your campaigns. The perfect solution for SEO specialists and search marketers alike, no other free tool offers as many keyword suggestions as WordStream’s Free Keyword Tool. Effective keyword research isn’t just about finding relevant keywords for your business – it’s about the structure and relationship between interrelated terms that align with digital marketing best practices. Save time and effort by identifying structured, organized lists of relevant keywords rather than wasting precious hours combing through a disorganized list of keywords. WordStream’s Free Keyword Niche Finder tool not only offers thousands of keyword suggestions based on your core terms, but also structures your results in a logical way, offering you the most profitable keyword niches for your paid search campaigns and new opportunities for search engine optimization initiatives. Finding relevant keywords for your campaigns can be challenging enough. Organizing them into structured groups that align with account organizational best practices is another matter entirely. That’s why WordStream’s Free Keyword Grouper is invaluable to search marketers. This free tool allows you to create tightly organized groups of themed keywords for inclusion in your paid search campaigns, allowing you to group up to 1,000 keywords into logical, relevant groups. One of the most common mistakes that even experienced search marketers make is failing to conduct thorough research into negative keywords that should be excluded from a paid search account. Failing to do so can result in wasted spend, irrelevant clicks, and lower conversion rates. That’s why we created the free Negative Keyword Tool. This free tool allows you to quickly and easily identify negative keywords that should be excluded from your campaigns. You can specify all major match types to exercise greater control over how and when negative keywords should be excluded, and identify negative keywords you may have overlooked during your preliminary keyword research. Once you’ve completed your comprehensive keyword research using WordStream’s free keyword tools, it’s time to evaluate the overall strength of your campaigns, and the best way to do this is by using WordStream’s free AdWords Performance Grader. The reports created by the AdWords Performance Grader are completely unique to your AdWords account, providing you with detailed insight into what strategies are working well and performing strongly, as well as identifying areas of improvement and actionable recommendations you can implement immediately to improve your account performance. 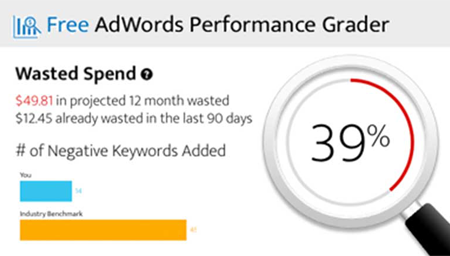 No other free tool provides as comprehensive an AdWords audit as WordStream’s AdWords Performance Grader. If you’re ready to see how well your campaigns are performing, try the AdWords Performance Grader completely free today.